Converting Email from Eudora: Why I No Longer Live at the P.O. I’ve been avoiding writing about how to convert email out of Eudora for several years now. Throughout that time, I’ve been using Gmail — through the excellent Mailplane — for my everyday email (see “Zen and the Art of Gmail, Part 1: Why I Switched,” 16 March 2011). But after 18 years of using Eudora, I couldn’t just quit cold turkey. The problems were twofold. Much as I like Gmail, there are certain things it can’t do that Eudora could, and there are the hundreds of thousands of messages I had stored in my local Eudora Folder. So I continued to use Eudora in small ways — sending bulk messages such as notifications of DealBITS drawing winners (I can’t imagine Gmail allowing a message with 900 recipients), spell-checking the weekly TidBITS issue in a Eudora window (since it sometimes catches mistakes that the Mac OS X spell checker misses), and retrieving the occasional old message from years in the past. Enter Mac OS X 10.7 Lion, and exit Eudora, thanks to the loss of Rosetta, Apple’s clever software for enabling PowerPC software to run on Intel-based Macs (see “Preparing for Lion: Find Your PowerPC Applications,” 6 May 2011). I’ve eliminated the need to use Eudora for bulk mailing with added functionality in the TidBITS Publishing System and I can live without the alternative spelling check (or maybe I’ll try Spell Catcher), but I really need to move my email out of Eudora and into some other program. Of course, I could just read the mailboxes as text files in BBEdit, but that’s silly. Obviously, if I had used IMAP instead of POP over the last 18 years, it would be trivial to point a different email program at my IMAP server. But like most Eudora users, I used POP because IMAP was relatively uncommon for a long time, and even after IMAP became more widely available, Eudora was never a very good IMAP client. The problem is that my Eudora Folder has somewhere approaching 1 million messages and thousands of attachments, stored in over 600 nested mailboxes. My Eudora Folder is nearly 8 GB in size, and since it has grown organically over 18 years and innumerable updates to Eudora, having been moved from Mac to Mac repeatedly over that time, corruption is undoubtedly lurking within the files. But while my Eudora archive may be larger than most, I strongly suspect that many people have been using Eudora for similar lengths of time and with similar sorts of corruption, which poses a significant challenge for import tools. There are two aspects to converting mail from Eudora: how you’ll convert it, and where you want it to end up. This is part of the reason I’ve put off writing this article for so long; there are a number of different conversion utilities, and even more possible destination programs. Worse, some of the destinations require use of specific conversion utilities, so they can’t be considered completely independently. Note that I’m not going to talk about converting Eudora filters or address books at all; even when it might be possible, I recommend you bite the bullet and start from scratch, refining your mailbox hierarchy and associated filters, and repopulating your address book from automatically captured senders (for my approach with filters in Gmail, see “Zen and the Art of Gmail, Part 2: Labels & Filters,” 16 March 2011). It’s more work, but you’ll end up with much cleaner, more predictable filters and an address book that isn’t weighed down by years of obsolete addresses. Here’s how I’m going to organize all this, then, and you may have to do a little jumping around to find all the information you need. First, you need to decide how you want to use your Eudora archive. Do you want to import it into your current email client? This option assumes, of course, that you have already switched to another client from Eudora for your everyday email needs. Or would you prefer to import your Eudora archive into an application dedicated to archiving email? In this case, it doesn’t matter what you currently use for email, and if you still need to make a switch, you can do so cleanly, without worrying about bringing in the baggage of your years with Eudora. On the archiving side, I examined MailSteward, Mail Archiver X, EagleFiler, and DEVONthink Pro Office. For these programs, the quality of the conversion is important, but, under the assumption that you may not already be using one of them already, I’ll discuss how usable they are. (Of course, if you are using EagleFiler or DEVONthink Pro Office already, that’s a major benefit to consider.) At the end of the article, I’ll discuss the various dedicated conversion programs I used — Eudora Mailbox Cleaner, Eudora OSE’s EudoraExport, and Emailchemy — consider that section akin to a sidebar in a print magazine. It’s worth noting that I did all these tests in 10.6 Snow Leopard, partly so I could compare how well they did with the source mailboxes in Eudora and partly because not all of them run in Lion. In general, I recommend you perform this conversion before you update to Lion, though there are options that remain if you’ve already upgraded. Finally, keep in mind that all of these conversions will be slow, and will require at least as much free disk space as the size of your Eudora Folder, so be prepared to clean up your hard disk and run them overnight, if necessary. I also found that the SSD in my Mac Pro significantly improved overall conversion performance over a hard disk. Pre-conversion Clean Up Tasks — Before you get started converting your Eudora mail, there are two cleanup tasks I recommend performing first (and another that I discuss in the Eudora Mailbox Cleaner section toward the end of the article). First, Eudora maintains your mailboxes as straight text files, but tracks which messages have been deleted from each mailbox via a table of contents located either in the mailbox file’s resource fork, or in a separate .toc file. Before you convert your mail, you should compress your mailboxes, to make sure that any deleted messages that haven’t yet been removed from the actual mailbox file are not exported with the rest. To do this to a single mailbox, click the box in the lower right corner of a mailbox window (or the middle right, if you have the preview pane expanded) that shows the number of selected messages, the number of messages in the mailbox, the size of the mailbox, and the space wasted on deleted messages. If that last number is not 0, you have deleted messages that haven’t yet been removed from the mailbox file. Of course, clicking that box for each of hundreds of mailboxes would be ridiculous; to compress all Eudora mailboxes, Option-click it (and give Eudora some time to work). Apple Mail — Apple Mail features a built-in Eudora importer that provides the most obvious approach for importing your Eudora archive. If it were the only option, it might be acceptable, but in my testing, it missed converting at least some very old mailboxes. In those it did import, it failed to bring in attachments, message status, and labels. Worse, in many mailboxes, it appeared to duplicate messages, with exactly half the messages being completely empty. This was annoying, but easily fixed by selecting the mailbox in question and choosing Mailbox > Rebuild. These results come primarily from Apple Mail 4.5 in Snow Leopard; although a smaller test import in Apple Mail 5 in Lion seemed to work, it was much slower due to running on an older hard disk-based MacBook as opposed to my SSD-based Mac Pro. Apple Mail can also import Unix mailbox files, so the question becomes, how do you convert Eudora mailbox files into Unix mailbox files (the two formats are similar, but not identical)? There are a number of options here, including the standalone program Emailchemy and a utility called EudoraExport that’s embedded in Eudora OSE. I had good luck with Unix mailbox files created by EudoraExport. It claimed to convert many more messages than Eudora Mailbox Cleaner, mentioned next, but failed to convert the same very old mailboxes as Apple Mail’s built-in Eudora importer. EudoraExport did associate attachments with their messages properly, but lost message status and labels. More on why I chose not to use Emailchemy toward the end of the article. The best overall results came from using Eudora Mailbox Cleaner, which converted everything — including attachments, message status, and labels (as colors) — and imported it directly into Apple Mail. The main annoyance is that Apple Mail won’t see the messages in one of these imported mailboxes until you select it and choose Mailbox > Rebuild. You can rebuild a number of mailboxes at once, but be sure to select something else after you choose Rebuild, because otherwise Mail wastes a ton of CPU power constantly recalculating how many messages are in the selected mailboxes. Getting to the point where Eudora Mailbox Cleaner worked properly did require some preparation, though, which you can read about in its section near the end of this article. In the end, any of these three methods would probably provide acceptable results, if your Eudora archive lacks the corruption that prevented some mailboxes from being imported and if you aren’t interested in attachments being included. If you do want attachments, it’s a choice between EudoraExport and Eudora Mailbox Cleaner. Assuming you have sufficient time and disk space, I recommend you convert with both and compare the results within Apple Mail. I do want to say a little more about Apple Mail. Thanks to its guaranteed position on every Mac user’s hard disk, it’s entirely reasonable to consider using Apple Mail as a repository for your stored Eudora mail even if you use another email client, since doing so would separate old mail from new mail. As a full-fledged email client, Apple Mail offers all the basic functionality you’d need to browse and search your old mail. Although I have long found Apple Mail’s searching to be troublesome, it appears significantly improved in Lion, with many more options for using multiple criteria in a search, and the capability to search not just in selected mailboxes, but in a folder that contains multiple mailboxes. I still find Apple Mail’s searching to be relatively slow; not unusable, but painful after becoming accustomed to Gmail’s lightning-fast searches. Lastly, you can extend Apple Mail’s searching with smart mailboxes, which offer more flexibility yet. What’s perhaps most important about using Apple Mail as a destination for your Eudora archive is that having email stored within it is potentially useful for possible future moves to other programs, since importing from Apple Mail is, if anything, more common than importing from Unix mailbox files. Plus, since Apple Mail is a good IMAP client, you can copy local mail in Apple Mail to an IMAP server, at which point you can access it from any other capable IMAP client. Thunderbird (and Postbox and Eudora OSE) — Mozilla’s Thunderbird is one of the most popular email programs around, thanks to being open source, and its open-source status has also resulted in its code being used as the basis for other email clients, notably Postbox ($29.95) and Eudora Open Source Edition, the official successor to the classic Eudora. Thunderbird and Postbox claim to be able to import directly from Eudora and Apple Mail, but Thunderbird’s Eudora import did almost nothing, creating what looked like the hierarchical folder structure of my stored mail, without any actual messages. Postbox labeled its Eudora import as “Experimental,” which in my case meant “Broken” since Postbox crashed instantly on every import. Confusingly, Eudora OSE eschewed Thunderbird’s import code for its own EudoraExport utility, and EudoraExport didn’t import mail from Eudora into Eudora OSE, instead creating Unix mailboxes of my Eudora archive with no indication of how to get them into Eudora OSE. Importing from Apple Mail was differently unsuccessful, since Thunderbird imported only local copies of mail from my active IMAP accounts, not the converted Eudora archives. I was surprised that Thunderbird wouldn’t import from Unix mailbox files, but I quickly found the Kaosmos ImportExportTools add-on to resolve that limitation. ImportExportTools did a fine job importing from the Unix mailbox files that Eudora OSE’s EudoraExport had created, even maintaining attachments. Unfortunately, despite the accurate import at the message level, ImportExportTools failed to maintain the hierarchical folder structure of what EudoraExport had created, putting all 610 mailboxes at the same level and rendering them nearly unusable. Using ImportExportTools to import .eml files from my Apple Mail email archive failed miserably in Thunderbird, and I wasn’t able to get ImportExportTools to work in Postbox, or perhaps I wasn’t able to figure out how to get Postbox to do what I wanted before I gave up in frustration. The best results came once again from Eudora Mailbox Cleaner, which can also import mail directly into Thunderbird. The results were just as good as with Apple Mail, with message status, labels, and attachments all preserved, along with the full mailbox and folder hierarchy. In the end, if you want to use Thunderbird, Eudora OSE, or Postbox, use Eudora Mailbox Cleaner to import into Thunderbird. Eudora OSE shares mailboxes with Thunderbird, so you can just switch to using it immediately if you want. For Postbox, you can in theory then move your mailboxes from Thunderbird to Postbox via the Finder, though this didn’t work for me and I ended up blowing away my Postbox profile entirely and having it import from Thunderbird fresh. That eventually proved effective, after quitting and relaunching, and then crashing and relaunching. Though Postbox looks much cleaner and more modern than Thunderbird, I’ve had significantly more problems with it during these tests, so I recommend approaching it a bit cautiously. 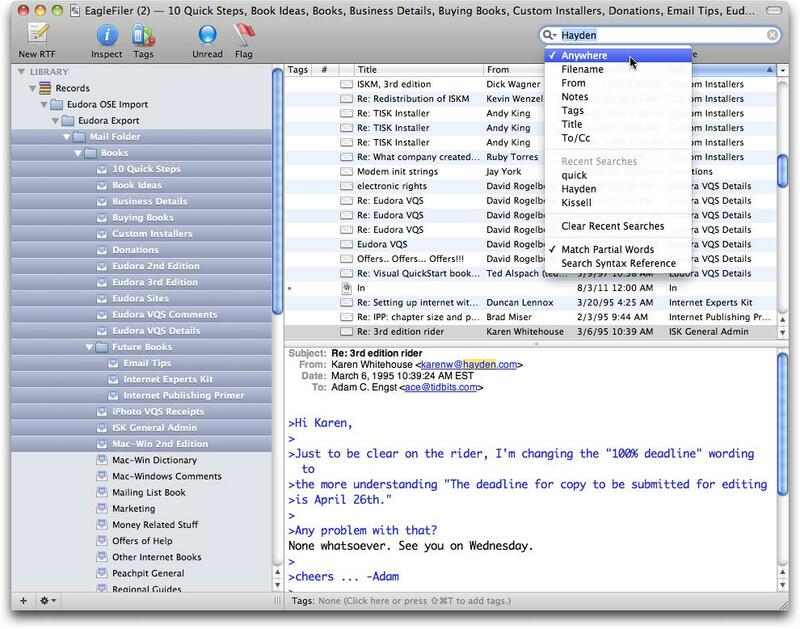 MailForge — The $19.95 MailForge, from Infinity Data Systems, is an independent effort to create a modern email client that looks and works much like the classic Eudora, even recreating the fabulous Option-click approach to selecting similar messages. Again, I’m not attempting to review it as an email program (it felt a little clunky in my brief usage), but I can say that its Eudora import worked quite well, missing only the same very old mailboxes that Apple Mail and EudoraExport also missed. It was able to bring in attachments, but lost message status and labels. MailForge also has experimental support for importing from Apple Mail, but only a single mailbox at a time, which renders it useless for importing an entire Eudora archive. Plus, with the mailbox I imported, all the dates came in as the same, despite being correct in Apple Mail. Give the Apple Mail importer a pass, and stick with the Eudora importer if you use MailForge. Gmail — Finally, I circled back to the question of whether or not I could get my email into Gmail. For this testing, I used a secondary account I have, since my main account doesn’t have enough space to store my entire Eudora archive. But extra storage space from Google is cheap — even $5 per year for 20 GB would be sufficient for everything I’d need. Unfortunately for me, I use the normal version of Gmail, not the version baked into Google Apps. This is not so much because of the cost — Google Apps isn’t terribly expensive, and we could perhaps even get by with the free version’s limit on 10 user accounts — but because we also run a lot of email services, and it has always seemed as though bringing Google Apps into the mix would add confusion. It’s unfortunate in this case because there’s a Google Email Uploader for Mac application that reportedly does a pretty good job with importing mail from Eudora, Apple Mail, and Thunderbird into Gmail. Alas, it doesn’t work with the normal version of Gmail, not because of any failing on its part, but because Google hasn’t enabled the same import hooks as in the Google Apps version, largely because of the far more significant usage it would get (and thus the more testing it would need). So for those of us using the normal version of Gmail, there are three options. First, you could in theory sign up for a free Google Apps account, use the Google Email Uploader for Mac to import all your email from Eudora, and then use an IMAP client to move it to your normal Gmail account. This might work, but I have a bad feeling that it would fall down somewhere, either in accuracy or performance. The second option is sufficiently tricky that I think it’s feasible only for people who are experienced email system administrators. Gmail’s built-in Mail Fetcher can retrieve email from any standard POP account. Normally, you’d use this to have Gmail pick up mail from another account in real time. But, you might be able to set up a POP server on your Mac, import your Unix mailbox files from EudoraExport into the POP server, and then get Gmail’s Mail Fetcher to retrieve them. If I were going to do this, I’d start with MailServe for Snow Leopard from Cutedge Software. You might be able to transfer your messages into its Dovecot server either by transferring them from Apple Mail’s On My Mac folders into Dovecot’s IMAP folders or by copying files into the right location. And once you had the messages in Dovecot, you could point Mail Fetcher at it. Most realistic is the third option: direct-to-Gmail copying from Apple Mail via IMAP — remember how I said earlier that Apple Mail could be a useful intermediary? This is easy to do — just select a folder or a set of mailboxes from Apple Mail and drag them into your Gmail account in the sidebar. There is one major problem with this approach: It’s so slow that you’ll think you’re accessing Gmail via a modem. As I sit here, watching my messages transfer, I’d estimate they’re moving at about one message per second. Assuming that I were to transfer about 900,000 messages, that would take over 10 days of straight transfer. Given that I wouldn’t necessarily be present to restart after any errors (my initial test failed silently after about 15,000 messages), I’d guess that the entire process would take me at least a month. Again, smaller email archives would transfer more quickly, but it would still be an onerous task. I’ve heard from people who have had better luck with IMAP transfers from Thunderbird to Gmail, but in my testing, Thunderbird was no faster than Apple Mail, implying that the bottleneck is at Gmail’s end. In the end, I don’t plan to move my Eudora archive up to Gmail. One final tip — if you do copy a mailbox to Gmail via IMAP and decide it was a mistake (perhaps because the transfer failed in the middle of a mailbox) do not delete the mailbox from within Apple Mail or Thunderbird. All that will do is remove the label from the messages in Gmail, ensuring that you’ll never be able to find them again. Instead, create a filter in Gmail’s Web interface that matches messages with that label and trashes them, then run the filter against existing messages. MailSteward — Let’s move on to the dedicated email archiving programs, which treat email as data, but don’t attempt to provide all the features necessary to send and receive messages. 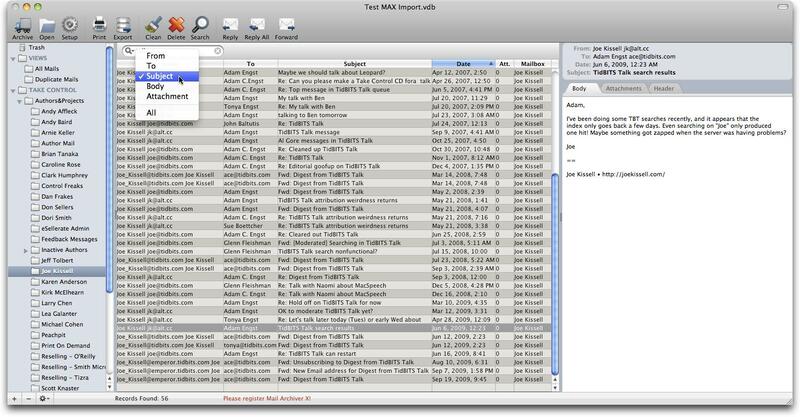 I first tried MailSteward ($24.95, $49.95, or $99.95, depending on version), a dedicated email archiving program that includes its own Eudora importer. In demo mode, MailSteward will import only 15,000 messages, so I pointed it at some representative mailboxes. MailSteward offers a good set of features for dealing with stored email. You can print, save, delete, or export the selected set of messages, and MailSteward provides plenty of export options, including one that will give you all the email addresses in the selected messages. You can also reply to messages and forward them — MailSteward sends them off to Apple Mail for that (regardless of your default email program). 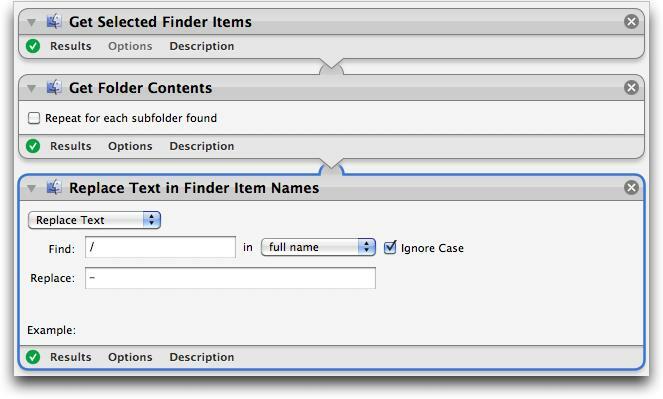 Searching in an archiving program is key, and MailSteward offers a powerful search capability. You can save searches or perform SQL searches, and MailSteward even lets you tag messages and search on the tags as well. The only problem is that searches that result in a lot of hits can take a while to display; luckily, targeted searches with only a few hits are instantaneous. Where MailSteward falls down for me is its failure to offer a hierarchical browser. For those of us with hundreds of Eudora mailboxes, all neatly nested, the hierarchy is a useful method of navigating, and it’s a shame to lose that, even if searching is more important. Apart from the attachment import problems, the lack of a browsing capability, and a somewhat clunky, old-fashioned look, I don’t think you’ll go wrong with MailSteward. It seems stable and fast, and has been around long enough that it is probably a reasonable long-term location for your mail. That said, it doesn’t feel like my cup of tea. 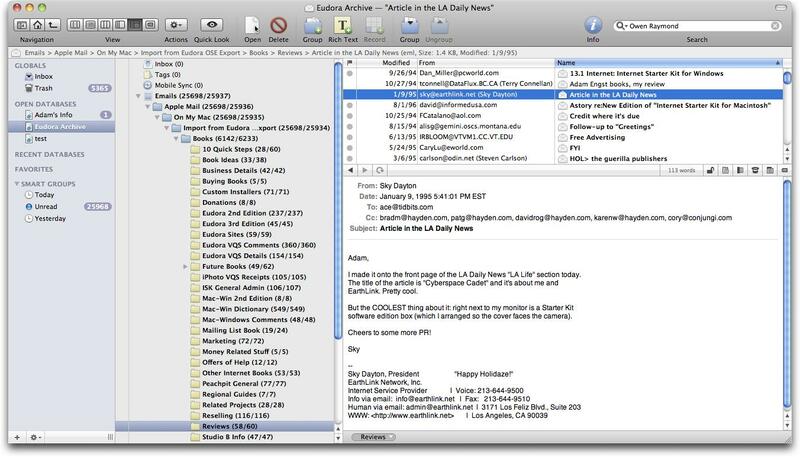 Mail Archiver X — Another dedicated email archiving option comes from Moth Software in the form of the $34.95 Mail Archiver X. It imports directly from a wide variety of email programs, including Eudora, and you can import either individual mailboxes or everything at once. When using the current version 2.6, I found that Eudora imports lost track of attachments while maintaining hierarchy, and Unix mailbox imports lost track of hierarchy while retaining attachments. When I contacted Beatrix Willius of Moth Software, she sent me a beta of 2.7, which enabled the Eudora import to bring in attachments properly, and said she would be enabling the software to maintain hierarchy with Unix mailbox imports once she tracked down some Lion-related bugs. In the search arena, you can limit a search by From, To, Subject, Body, and Attachment, though only one at a time, so you can’t search for mail from a particular person that has certain word in the attachment name. Searches are fast, but seem to be limited to a single mailbox at a time. On the plus side, Mail Archiver X has some unusual capabilities. First, when you’re importing, you can filter the messages to be imported by date ranges, and you can perform some cleanup tasks on incoming messages during import. If you’ve ended up with many duplicate messages, Mail Archiver X can find and delete them. It can even export messages in numerous formats, including Unix mailbox, FileMaker, MySQL, and XML, which could make it a useful intermediary if you wanted to move mail into a custom database. At the moment, it’s hard to recommend Mail Archiver X for a large Eudora archive that you’ll be accessing regularly, but given its active development and responsive developer, it could become a significant contender. EagleFiler — There are also more general document management applications that can serve as a home for imported email, including C-Command’s $40 EagleFiler. While EagleFiler can theoretically import mail directly from Eudora, Michael Tsai of C-Command suggests in the documentation that an alternative utility might provide better results. Since EagleFiler can import both Unix mailbox files and .eml files (used by Apple Mail and a few other email programs for storing individual messages), I opted to drag in the folder of Unix mailbox files created by Eudora OSE’s EudoraExport. The import worked perfectly, with EagleFiler bringing the mailboxes in fairly quickly, and preserving the entire folder structure for easy browsing. EagleFiler does take quite a while to index the entire import, not surprisingly, but its Activity window gives you a good time estimate. Once it’s done, you can perform searches that are relatively focused, by From, To/Cc, and Subject (along with notes and tags you apply within EagleFiler). However, you can’t, as far as I can tell, search by date or attachment name or other email-specific fields. There are also a few infelicities that Tsai says he’s working on rectifying. First, if you select a folder containing mailboxes and do a search in it, you won’t find anything. Instead, you must select all the mailboxes together, and then do the search. Second, if you search in a single mailbox, EagleFiler reports the number of hits in the window title bar, but if you search in multiple mailboxes, it just lists the selected mailboxes (which won’t fit), hiding the number of hits. With the massive amount of mail I imported, I also found EagleFiler searches a bit slow; not unusable, but definitely not instantaneous, and since the search is retained when you switch mailboxes, you sometimes have to wait for a long search to fail before you can delete it. You can read messages in plain text within EagleFiler’s preview pane. If you double-click a message to open it, though, EagleFiler opens it in your default .eml viewer, which is likely Apple Mail (although Sparrow tried to take over that filename extension on my Mac). That’s a little disconcerting at first, but probably a reasonable approach, since it makes responding to the message or forwarding it easy. If a message has an attachment, it’s preserved, but again, you can’t access it from with EagleFiler itself, though you can get to it once you open the message in Apple Mail. I’m not quite sure what to conclude about EagleFiler. I find it easy to use, attractive, and entirely functional. I also like the fact that it’s from Michael Tsai, whose SpamSieve I’ve long admired — he’s a thoughtful, careful programmer. But EagleFiler is also slower at searching my massive email store than I’d like, and that made some of my usage patterns clumsy. If you were using EagleFiler (or if you need something like it) for other purposes, I think it’s a good choice, but I’m not sure I’d recommend it for the sole purpose of storing email from Eudora. DEVONthink Pro Office — Speaking of utilities that you might be using for another purpose, I store certain documents in DEVONthink Pro Office, and it can also import email messages from Unix mailboxes, Apple Mail, and Microsoft Entourage. I first tested it with a single mailbox, and it worked reasonably well, splitting the mailbox into individual messages. Importing an entire corpus of mail from Eudora requires a bit more effort, though. Although DEVONthink Pro Office can import Unix mailbox files, there are two problems. First, it sees them as mailbox files only if they use the .mbx or .mbox filename extensions. I imagine most Eudora users would have to rename all their mailboxes for that to be true, but an Automator workflow could do that quickly. Second, and much more problematic, DEVONthink Pro Office can import only a single mailbox at a time, not everything or even a folder. 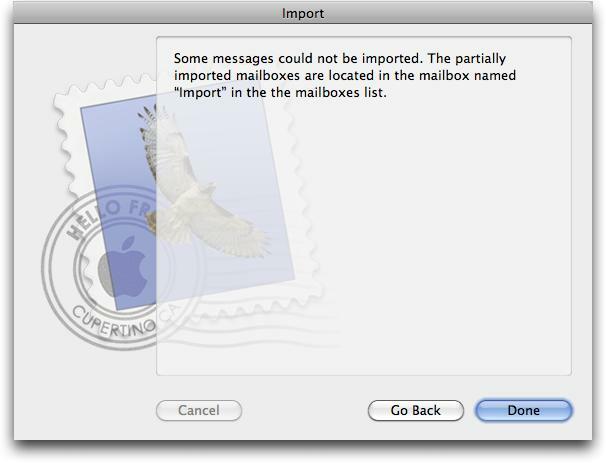 Nor can you Shift-select multiple mailboxes in the Import dialog. So, for a clean import from Apple Mail, choose File > Import > Email, choose Apple Mail from the Mail Source pop-up menu, select the folder containing all the mail you want to import, and click the Archive Mailbox button (the Import Mail button works only on individual mailboxes). In my testing, DEVONthink Pro Office imported very quickly from Apple Mail, though when I tried to import my entire Eudora Folder in one chunk, it failed silently at some point. Importing second-level folders worked better, but I still had some failures, identified only as connection failures in DEVONthink’s log. Eventually, I tracked the problem down to timeouts due to trying to import folders containing somewhere near 30,000 messages — if you wanted to import such large mailboxes, you’d want to split them in Eudora first or use both of these Terminal commands to increase DEVONthink’s timeout values. Even still, folder imports failed for me, though I was able to bring in individual large mailboxes one at a time, quitting and relaunching in between each mailbox import to maintain performance. Unfortunately, attachments were lost entirely. When browsing through email, DEVONthink’s default columns aren’t terribly useful, but you can easily customize those that are showing to display the From, Subject, and Date values from each message, giving DEVONthink an email-like view. Searching in DEVONthink is very good, with simple searches across the entire database being instantaneous — definitely the fastest I’ve seen. You can limit searches by name, content, URL, comment, or metadata, which is a little confusing if what you want to search on is From, To, Subject, and so on. But DEVONthink’s raw speed makes up for a lot, and if you need to create complex queries or search in particular folders or mailboxes, the separate Search window provides all the power you need. That said, there is one problem that will prevent me from using DEVONthink Pro Office for a while, which is that DEVONtechnologies tells me that performance may begin to suffer when the database gets more than 200,000 to 300,000 entries in it (because of the import timeouts, I have only about 125,000 messages imported so far). I’m told that when a future version of DEVONthink becomes a 64-bit app, this limitation should disappear — that update shouldn’t be too far off. My other hesitation in recommending DEVONthink Pro Office is that it’s the most expensive of all these programs, at $149.95 (the cheaper versions of DEVONthink can import mail via AppleScript, but lack the Apple Mail integration that makes the import sufficiently fast). Of course, if you already use DEVONthink Pro Office, that’s not a problem, and if you don’t have the volume of mail I do to import, you probably won’t have difficulty either with import timeouts or performance problems with a too-large database. Now for some notes on the different conversion programs I used. Eudora Mailbox Cleaner — My first choice for a conversion utility was Andreas Amann’s donationware Eudora Mailbox Cleaner because Tonya had used it successfully back in 2008 when she moved from Eudora to Apple Mail (see “Reluctantly Switching from Eudora to Apple Mail,” 13 April 2008, but note that after a year or so of struggling with Apple Mail, she gave up on it and switched to Gmail). Eudora Mailbox Cleaner can import directly into either Apple Mail or Thunderbird. After creating the text factory, I told it to run across my entire Eudora Folder (after making a backup to another disk, of course). It failed on three mailboxes that had somehow ended up with Western (ASCII) encoding rather than UTF-8, but I was eventually able to fix those as well by transferring messages to new mailboxes within Eudora. Once I cleaned up my Eudora Folder in this way, Eudora Mailbox Cleaner worked swimmingly with both Apple Mail and Thunderbird. Eudora OSE and EudoraExport — An unexpected success came from Eudora Open Source Edition, the Thunderbird-based replacement for classic Eudora from an open-source team that includes some of the original Eudora developers. I thought it would bring old Eudora mailboxes into the new program, but instead, its import function actually ran another program called EudoraExport that traversed my entire Eudora Folder, message by message, and created another folder of proper Unix mailbox files. There was no option to select a subset of mailboxes for conversion. EudoraExport also cleaned things up and reported on the errors, not that there was much I could do about them. Because it worked on a per-message basis, rather than a per-mailbox basis, EudoraExport was far, far slower than Eudora Mailbox Cleaner, but it may have done a better job in terms of the number of messages converted, since it reported 970,283 messages converted, in comparison to Eudora Mailbox Cleaner’s 849,206 messages. Of course, it’s also possible that the programs are simply reporting numbers somewhat differently, since I can’t figure out from which mailboxes 120,000 messages might be missing in the Eudora Mailbox Cleaner conversion. EudoraExport did miss some very old mailboxes — sent mail from 1992 and 1993 (12 mailboxes for each), and 7 mailboxes from 1994 as well. That’s distressing, but since Eudora Mailbox Cleaner converted them properly, I can combine the strengths of both. To verify that EudoraExport had done what it said it did, I imported its folder of Unix mailbox files into Apple Mail, where I discovered that although it hadn’t maintained message status or labels, it had properly associated attachments with their messages. I was also able to import its Unix mailbox files into other programs successfully. Because of this, I’d rank EudoraExport as the best option if you want Unix mailbox files, though it’s worth trying Eudora Mailbox Cleaner as well and comparing the results. Emailchemy — Next up is Weird Kid Software’s Emailchemy, which is still under active development. It’s a $29.95 commercial application, but has a free demo available that changes the Sender and Subject fields in converted mail. When I fed it a small number of mailboxes, Emailchemy converted them to Unix mailbox files, but did not maintain attachments (even though it claimed it would), message statuses, or labels, as Eudora Mailbox Cleaner had. That wasn’t ideal, but also not a show stopper. But when I fed it my entire Eudora Folder, it got partway through and hung. Matt Hovey of Weird Kid Software provided two useful suggestions, one of which resolved the crashing problem. First, if you press Shift while clicking the Write Conversion Log checkbox in Emailchemy’s Logging preferences, it goes into debug mode and writes out a more-verbose log that could help identify where it was crashing. The second suggestion rendered that unnecessary, though, since it turns out that there’s an option in Emailchemy’s Eudora preferences to ignore the table of contents for each Eudora mailbox. By default, Emailchemy pays attention to the table of contents, which enables it to skip deleted messages that haven’t yet been purged by compacting the mailbox. But it also renders it more susceptible to corruption, and indeed, when I told Emailchemy to ignore the table of contents, it was able to convert my entire Eudora archive successfully. Interestingly, on the successful run, Emailchemy not only converted attachments properly, it claimed to have converted more messages — 971,705 — than either EudoraExport or Eudora Mailbox Cleaner. There’s no way of knowing where the difference lies, especially since the demo’s obscured Sender and Subject fields made it nearly impossible to compare its results against the other utilities fully, since it was difficult to identify the same messages across different conversions. Hovey chose not to provide me with a license, so I could test only the demo version. Emailchemy goes beyond just simple conversions from Eudora to Unix mailbox files. You can also convert selected mailboxes from many different email programs into a wide variety of formats, making it by far the most flexible of the conversion programs I’ve discussed. One of those formats serves as the source for a local-only, read-only IMAP server, so you could import converted mail into any IMAP-capable email program. If you use Gmail in Google Apps, Emailchemy also includes its own Google Apps uploader; I don’t have a Google Apps account to compare this to Google Email Uploader for Mac. Finally, Emailchemy provides three email-related utilities: one that splits large Unix mailbox files into smaller chunks, one that harvests email addresses from your mailbox files, and one that cleans up unnecessary files left over after upgrading from Apple Mail 1.0 to Apple Mail 2.0, introduced in Mac OS X 10.5 Tiger. Hovey told me that he recommends people try the free options for converting email from Eudora first — Eudora Mailbox Cleaner, EudoraExport, and even Apple Mail’s built-in importer — and turn to Emailchemy only if they aren’t sufficient for the job. He claimed that Emailchemy may do a better job with corrupt mailboxes, mailboxes that include non-English messages, mailboxes from multiple versions of Eudora, and anything that’s out of the ordinary. Plus, and this is important, Emailchemy works in 10.7 Lion, whereas both Eudora Mailbox Cleaner and EudoraExport are restricted to 10.6 Snow Leopard. 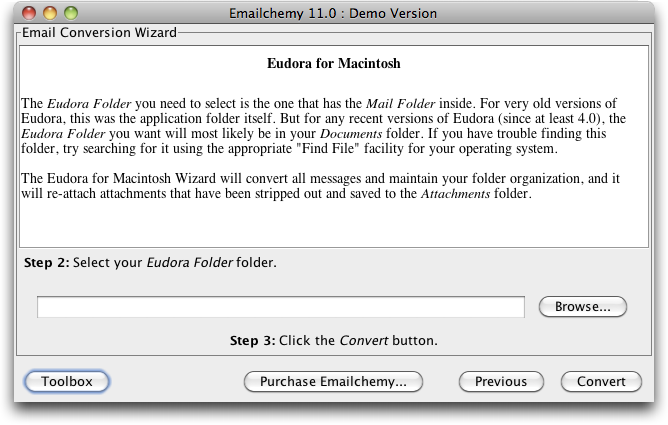 So, if you’ve already upgraded, and you don’t want to use Apple Mail’s Eudora importer, take a look at Emailchemy. Aid4Mail — Finally, speaking of different operating systems, several people have recommended Aid4Mail to me, but it runs only in Windows, and I’m not nearly desperate enough to spin up a virtualization program for this purpose. I mention it here merely for completeness. Also, I have no idea how any of the other programs I talk about here work on email from the Windows version of Eudora; it’s not difficult to convert the line endings so the Windows Eudora files are the same as Mac Eudora files, but if you’re already using Windows, Aid4Mail might be worth a look instead. Making a Choice — Honestly, as I wrote this I found myself paralyzed by all the possibilities. In the end, once it can handle my full Eudora archive, I think I most appreciate how DEVONthink Pro Office provides such lightning-fast searching, even though it failed to bring in attachments. Its high price prevents me from recommending it wholeheartedly for email storage alone, though it’s a good and powerful program for storing all sorts of other information as well, and I have no problems recommending it for broad use. However, now that I have my entire Eudora archive in Apple Mail, I think I’m going to leave it there as well, in case I ever want to move it somewhere else. I’ll stick with either the version of my Eudora archive created by Eudora Mailbox Cleaner (which maintained some message status, along with attachments) or Eudora OSE’s EudoraExport (which didn’t maintain message status, but did bring in attachments and which seemingly found about 120,000 more messages). I’m not a fan of Apple Mail, but its future is guaranteed and I don’t need to use it for anything but access to this email archive. For you, however, I suggest returning to my original questions — do you want your email in your current email client or in an email archiving program? If the former, your task is limited to making the conversion work; if the latter, you must decide which of the email archiving programs best meets your needs. Comments About Converting Email from Eudora: Why I No Longer Live at the P.O. Do you have any idea why Steve Dorner doesn't simply write an updated Eudora? I guess asking that is like speculating why Bill Atkinson never created an updated Hypercard. I know that I, and members of my family, will be using your article a our manual. I'm surprised you didn't evaluate GyazMail. I dumped my Eudora archive, which dates from 1989, into GyazMail and just moved on. With complete key-command customizability, and UI flexibility, I was able to mash GyazMail into a reasonable Eudora facsimile. Took me about a month to adjust fully, and I've never looked back. Had to draw the line somewhere, since there are a ton of mail clients, and the fact that the Gyazmail site has been down for weeks didn't help. How did you import into Gyza? I am testing Mail, Gyza and Mailforge. Mailforge won't import or collect mail, Gyza collects but I can't figure out how to import. Mail.app has done both so far. Adam - Did you ever consider importing your (wow! huge!) database into Filemaker Pro? No, email is complex enough - and there are enough dedicated solutions - that I saw no reason to attempt to build something myself. I could see this happening only if there was some special reason, such as to integrate with some other FileMaker solution, or to serve a workgroup, or something like that. Actually, although using BBEdit to view Eudora files may seem "silly" it may be the simpliest option for folks like me who have only the occasional need to find something in an old message. I just use BBEdit's multi-file search function, and so far it has met my needs. That would probably work just fine for my paltry Eudora holdings as well, although when you have almost a million messages spread out over 600 mailboxes, I think you may want a solution more targeted to archiving, indexing, and retrieving messages than a plain text multi-file BBEdit search. Yeah, that's kinda what I meant. I can't imagine dealing with 600 mailboxes, and I'm glad I don't have to. Works for now since it's pretty infrequent that I have to do it. Heh - yes, as with Charlie above, searching through the text files will work, but isn't a particularly good user experience. I think it would work for very occasional searches where you are pretty certain what you want. It's when you need to try a few searches and winnow down a large set of results by refining them that the text file searching approach will fall down. I think I've accepted the fact that it is history. Never thought I'd say that, but anything that old is so stale, I've probably forgotten it anyway. Items that were personally emotionally valuable to me, I've salvaged by what ever means possible at the time. To the guy avoiding Lion, I have a cloned b/u of my Snow Leopard that suffices. Thank you Adam for writing this very good article and commenting on the other Email options. Unfortunately, like you, I have many years of Eudora Email and hundreds of folders associated with a large range of subject material. In my case, I've decided to stick with Eudora, running on a mid 2010 Mac mini under OS X 10.5.8, which has been bullet proof with respect to Eudora, in my experience. May regret this some day, but I have too much invested in Eudora, to invest more in something else, after all these years. I used Emailchemy to convert from Eudora to Apple Mail earlier this year. I too had some trouble getting it to include the attachments, but after several failed attempts, I figured out that Emailchemy expects them to be in Eudora’s default attachments folder. I had configured Eudora to put the attachments somewhere else, and Emailchemy wasn't smart enough to read that setting from Eudora's preferences file. After I copied the attachments to the default location, Emailchemy was able to do the conversion with all attachments intact. I have similar problems but during importing Unix mbox files into Apple Mail. The files have been created by elm, pine, mutt and netscape. Many have missing From attributes and other faults. I'm still searching for a program helping me to repair this E-Mails before I import them. Unfortunately the import capabilities of Apple Mail are very limited. I didn't look at importing from other sources, but Emailchemy is probably your best bet. You might also try importing into a different email program like Thunderbird (with the ImportExportTools) and then import from that into Apple Mail. Adam, imagine the collective hours your research has saved us! Thank you. Perhiperal question: I've ≈1000 words added to my Eudora User Dictionary. Do you know of an easy way to add or merge those into the System's spell-checking dictionary? We have an article about adding words to the dictionary from a while back. Might require some text munging. Thanks for the timely article. I found it by Google just 7 hours after you posted it. I've now switched from Eudora to Apple Mail with your help. I just got my 1st issue of TidBITS since switching. It's in text format and looks okay in Mail but when saved as a plain text file and opened in Xbit, each apostrophe is replaced by a comma, an A with an umlaut, and an o with a caret. Dashes and some other characters are also replaced. In Tex-Edit Plus, it's even worse with characters substituted for the line and paragraph breaks. Yet, it looks fine in Text Edit. I never had this problem with Eudora. Is there a setting I'm missing or a conversion I can do? Also, is there any sustitute for Eudora's "Send to Browser" function for getting HTML messages into Safari? I've saved such files as eml, stripped headers in a text editor, and changed the extension to "html". That works for some messages like the ones I get from Macworld but not for the ones I get from my cable provider. Ron, the trick is that there's something wonky with your text encoding settings. Try choose Message > Text Encoding and set it to either Automatic (which should work, but is likely already the default) or UTF-8. I don't know of a way of sending Mail messages to a browser, but the question is, why would you want to? In Eudora, that was necessary to view complex HTML, but Mail uses WebKit, so it should be able to display anything. The encoding of the TidBITS issue was set to Automatic but no other encoding I set it to in Mail before saving worked including UTF-8. Then I opened the first save in TextEdit (where I confirmed that Automatic was UTF-8) and changed the encoding in it's Save As dialog. I found that saving as either UTF-16 or Western (Mac OS Roman) fixed the characters in Tex-Edit Plus. There were still some line ending issues but the LF to CR function took care of that. If this fixes Xbit as well, I'll see if I can create an automator script to simplify the process. Thanks for the suggestion. As for Safari, Mail displays the HTML messages just fine but I prefer to save them from Safari in webarchive format and store them into appropriate Finder folders. I'm not as mail-centric as you are and keep very little in e-mail. That strikes me as very wrong - Mail should be able to do the right thing with the encoding. So far, everyone who has written in with this problem has been able to tweak the encoding to work properly. What's weird is that it really shouldn't be necessary, since our messages are properly formed, and Mail should always (as it does for most people) be able to set the encoding properly automatically. As far as saving messages out of Mail, you might look into one of the email archiving solutions - something like DEVONthink or EagleFiler or MailSteward - which would provide an easier way to save the messages and then give you a better environment than the Finder for sorting and searching them. Mail apparently saves text messages in the original format, typically UTF-8 with Unix line endings (LF). Eudora apparently translated them to Western (Mac OS Roman) with classic Mac line endings (CR). Xbit and Tex-Edit Plus display Mac OS Roman and UTF-16 fine but not UTF-8 which only matters for characters outside the normal ASCII range like curly quotes. Tex-Edit Plus also doesn't handle Unix line endings unless you ask it to convert them. TextEdit and TextWrangler display any of the 3 encodings and either line ending okay. Using AppleScript and Automator, I created a folder action such that when I move a text file saved from Mail into a particular folder, it opens in TextWrangler which converts it to UTF-16 with Mac line endings, a format all the applications display correctly. This also works for issues of TidBITS I have Xbit retrieve from the website when it doesn't arrive in Mail. Before, such issues were hard to read because the special characters were garbled. I have only been using Eudora for 16 years . . . a mere sophomore compared to your 18 years. The article, written for a niche readership, was exactly what I have been looking for. I ultimately decided to convert everything to Apple Mail using Eudora Mailbox Cleaner. Thanks for the walk-through. As I proofed the conversion, I found myself sucked into emails that I had exchanged with friends on my Powerbook 180 in the mid-1990s. Was I really that much of a fan of Van Halen? Yeah, I've had exactly the same problem with getting sucked into old mail. I even found my blood pressure rising if I happened on old arguments! Adam: To me, one of the most important features of Eudora is its ability to edit received mail from within Eudora, as if the messages were word processor documents. It is the dominant reason why I keep using Eudora (under 10.6.7). And one of the most important reasons why I dislike Apple's Mail is the absence of such an editing capability. Your (superb) article never addresses this point, and I would be very grateful for information about which email clients have this ability. Postbox claims to have it, but offers no decent Eudora import capability (which rules it out for me). Mailforge also claims it, but even after 4 years of work is still not better than an immature beta (too risky to use for serious work). In Eudora, John, you could edit any incoming message just by clicking a button. Some people found that very useful for adding notes, trimming crud, and so on, but it's an uncommon feature. I use "pencil edit" in Eudora regularly to highlight items of interest. There is a continuing thread on this issue at https://bugzil.la/360975. Does Apple Mail have a highlighter? Alas, I have not done a survey of which email clients provide this unusual feature of Eudora. It was something I used occasionally, but hadn't built any sort of workflow around. One thought. Both EagleFiler and DEVONthink allow you to add metadata (Notes in EagleFiler, Spotlight Comments in DEVONthink) to a message, so if you're editing a message to add information, that might be an interesting alternative. That points at the general question of what exactly you achieve by editing messages, and if there's an alternative method of achieving that goal. I use that feature often to change a subject line. I also have a folder containing usernames and passwords for some accounts. If I ever have to change one, I just edit it instead of making a new one. Yes, I could always send again but the user/pw ones I never even sent. Just made a little note and filed it in the mailbox. Whilst I realise that Apple Mail is not everyones's cup of tea I converted my E-mails from the horrors of Outlook Express to Apple Mail with the launch of OS X 10 years ago. My mail boxes have since followed me across multiple Macs (both at work and home) as well as iOS devices, and while some of the changes that have come have caused a few problems at the time I've been happy with a very stable and capable E-mail client. I have always found searching within my mailboxes to be very fast and reliable (non of my colleagues using Windows can find old archived E-mails as quickly), but if anything find the new search in Lion to be more problematical - however, this may just be unfamiliarity. I am not keen on the new default look to Mail (including conversations) but have now managed to get just about everything back to the old look and feel. What's more, Apple Mail is free and you don't have Google reading all of your E-mails. I'm glad you're finding Apple Mail effective for your use, but let's not exaggerate what Google is doing with Gmail. Gmail indexes the contents of your email for the purpose of enabling you to search (which is how Gmail does everything). Google is not "reading" your email, and does not have any capability to do things along those lines beyond what any other IMAP-based email provider would. And even with POP, until you download (and delete from the server) your mail, it is within the power of the email provider to access. Adam -- I went through the hell you so aptly describe last spring, when Eudora suddenly and inexplicably started crashing on startup (in Snow Leopard). It never ran again. I finally ended up at the solution you did -- Eudora Mailbox Cleaner into Apple Mail.app (to which I have never accommodated; I still miss Eudora every day). I only wish that the other option you outline had even occurred to me, that of treating the Eudora mail as an archive and moving forward. As it is, I dragged that whole archive (21 years) into my Mail.app experience. BTW I find searching its slower and more limited than Eudora's, but certainly workable enough. Ugh - at least I was able to make my transition to Gmail without worrying that I was losing Eudora completely at the time. But I too was having enough crashes (and corrupted mailbox ToCs) that switching for day-to-day mail really wasn't optional. I had the same problem. (My situation is very similar to Adam's, hundreds of thousands of e-mail message in hundreds of hierarchical folders.) I found that the problem was one mailbox containing corrupt messages from one mail list. I deleted that box, switched to digest mode and the crashing problem ended. Lots of great info here. I use GyazMail now and think it does a good job. I used Eudora for about 12-13 years (at some point about halfway through I converted to Mail and then converted back to Eudora) and finally gave up on it a few years ago. . Importing to/from Gyazmail is easy since it can import/export the mbox format. I join with everyone in owing a debt of gratitude to Adam for giving me courage to finally move 14 years-worth of Eudora mail in several levels of nested mailboxes spread over three separate accounts into (after some experimenting with other clients) Mail.app (Eudora 6, Mac Pro, OS 10.6.8). Surprisingly the Eudora OSE import command did not activate Eudora Export for me - and it didn't do anything else either. Of the recommended options, conversion to .mbox with Emailchemy and importing from within Mail seemed smoothest and most complete. Mailbox/folder nesting was preserved but all imported messages were marked as unread. The major surprise for me was how really crude the Mail.app experience seems after 14 years of using Eudora. The way Mail handles mailboxes has been a source of major frustration. With Eudora I found it convenient to create separate Eudora Folders for my three accounts, each accessible via an alias of the respective settings file in the dock. That way I could locate an item that I need much faster than when the mailboxes (and their subfolders) for all three accounts are crammed into a single sidebar - especially as mailbox folders enclosing subfolders will not open with a double click, precise clicking on the triangle is required. The ability to access mailboxes from the Eudora Mailbox menu - drilling down through successive subfolders, if required - is vastly superior. Similarly Mail's procedure for moving messages and/or creating rules is really primitive compared to Eudora's facility to create destination mailboxes as part of a single seamless process. Given that development of Eudora ground to a halt in 2006 one could be forgiven for expecting a lot better from Apple's in-house e-mail client in 2011. I have been using Eudora for 14 years. Still working well on Snow Leopard (seldom crashes - once or twice a month). Search is very efficient and fast. I love the editing function for received messages. I keep only the section I am interested in (for ex. in the weekly TidBITS news). One thing I haven't found in Apple Mail is how to redirect. I redirect (rather than forward) some emails to my husband so that he knows immediately where they comes from. I normally start Eudora from its settings so that I can use different accounts totally separately. I know I have to move forward, but in a way it is moving backwards. I'm no fan of Apple Mail, Florence, but it does have a redirect feature. Select a message and choose Message > Redirect (Cmd-Shift-E). Thanks. By the way I still have your book on Eudora 4.2 and I still refer to it once in a while. I was pleased with how well that book remained accurate through new versions of Eudora - some things obviously changed, but the core was pretty good. Of course, that's a testament to Steve Dorner's design. I have just got to where you finally arrived in September. Your long article is just the thing to get me to do what you have done and, more importantly, provided me with a road map. I am very grateful. I have two related questions. First, "mail.mac.com" as my mail server address simply stopped functioning today. I have an Apple Mail account (obviously) but I can't find what to do to fix the problem they have presented to me. Any suggestions? Please. Second, do you have an later thoughts on what you wrote in September? Thank you so much for your research, as others have expressed, but also for your exceptionally clear writing. As a writer and editor, I have to way the value of info against their deplorable writing skills, so thank you again. I've been as loyal as a devoted pet to Eudora - and Imagina for that matter. They're now integra,net but let me keep my same imagina.com address for 16 years!. And now I'm a babe in the woods because I'm convert from my creaking PC to my shiny new IMac . . . and just learned about Apple's execution of Eudora. I'll adapt to 'Mail' in time, but how can I simply store and read old Eudora mail on my Jan 2011 Lionized Imac? Alas, there's no way around converting it, as you read above, and where it ends up is a matter of preference. Mail is certainly the easiest location, especially when converting from Eudora Mailbox Cleaner. Thanks so much for your research. I've been using Eudora for about 12 years. I'm switcing over to Lion 10.7.3 from Tiger 10.4.11 which is a large step. I'm a web designer so had to buy mostly new software for Lion which is why I took so long to make the leap. I've been paring down my Inbox and outbox and other mailboxes over recent months so those aren't too much of a problem. However, one thing I use everyday in Eudora is to write documents like a word processor (not meant for email). I have multiples of research documents all color coded and saved as Eudora files. Do you know of a similar program that will be able to open those documents and preserve the colors (BBedit doesn't work) even if it isn't an email program? (Word is not suitable). I feel like I'm about to go to a funeral for a trusted friend - my beloved Eudora!! I don't know of anything that can read Eudora's styling offhand (TextEdit won't), but the one thing I found that works to retain styling is to copy and paste from Eudora to TextEdit or Word or Pages - anything that accepts styled text in the clipboard. So, it's not ideal, but you can copy and paste into something else, one document at a time. With the demise of MobileMe looming at the end of the month, I need to switch to Lion right away. I stopped using Eudora a year and a half ago, so I'm tempted to go with the easiest way to have my old mail available without doing a full migration. So I was thinking about just copying my Eudora mail and attachment files onto some kind of external media and putting them onto my old PowerBook. Does that seem like a workable BandAid? All insights appreciated. Thanks. I think that's fine, but it's worth remembering that some of these utilities work only in Snow Leopard, so it might be worth doing the conversion sooner rather than later, just in case. I am trying to follow your suggestions to convert my mailboxes to Apple Mail via Eudora Mailbox Cleaner (Eudora 6.2.4, OS X 10.6.8). When I option-click the box in the lower left-hand corner of a mailbox, a message comes up saying, "Scheduling Compactions." Mailbox names flash on and off, the message closes and the right-hand number in the message-counter box changes to 0, but when I open other mailboxes, that number hasn't changed. Also, I ran the BBEdit text factory you suggested and transferred the messages from the problem mailboxes to new ones, but still get errors. UPDATE: I must not have waited long enough after option-clicking. Now all the mailboxes show 0 unused disk space. Yes, mailbox compaction across all mailboxes can take a little time. As far as the text factory goes, it's possible that there's a different form of corruption that you'd need to tease out and solve in a similar fashion - impossible to say without a lot of specific testing. When the mail box cleaner didn't work multiple times, even though I did text compaction and eliminated the /, I sprung for the $29.95 and got Emailchemy and it worked like a charm, migrating all my mailboxes intact and retaining all my attachments. Now I'm ready for Lion and M/Lion. Adam, thanks for the gold here but in steeling myself to do this migration I can't find the EudoraExport feature/utility embedded within Eudora OSE (1.0). Can you or someone give me a pointer as to where to find it? Thanks. I think it's in the Tools menu, under Import (since you're exporting from old Eudora and importing into Eudora OSE). Thanks Adam, I didn't see it there. Selecting Import initiates a dialogue with an Import Wizard asking if you want to import Address Book, Mail, etc. When I said Mail it asks about the location of the Eudora Folder then goes to work importing (yes 18 years worth of Eudora Folders:-) This will take sometime and I will report back. What I *had* wanted to do was select one mailbox at a time and ready it for moving into Apple Mail. I'll explain why later but I don't see a way to uninstall Eudora OSE? btw EudoraExport isn't considered a Add-On, Extension or Plug-In is it? Ok correction - though nothing is called EudoraExport per se - I now see that as Eudora OSE is Importing all the mailboxes.. if I tab toggle between Apps that are running I see I'm running Eudora OSE *and* EudoraExport (with the same icon) so I guess I'm in EudoraExport mode. I'll report on the results. Eudora OSE is just an application, so you can delete it from the Applications folder to remove it. EudoraExport is, I think, within the Eudora OSE application package - it's a separate app (and is PowerPC so it requires Rosetta). I need to Eudora (Mac) -> Gmail for family members and this article is absolutely wonderful! Thank you Adam for writing this up. I'm looking into Aid4Mail to convert Eudora (Mac) -> Outlook (Win) -> Gmail. Gmail Uploader for Mac doesn't convert attachments so I'm willing to route through Outlook (on Windows). I tried using the trial home version of A4Mail to convert mail for Eudora for Mac. I ran the trial under WinXP on a BootCamp'd MacBook. Moving the mail to WinXP was a bit of a hassle and it was amusing to see the antivirus springing to action to quarantine years' of Windows malware in the archive that had never bothered OS X. After transferring the Eudora Folder, I configured A4Mail to convert Eurdora to an Outlook PST. The test version is limited to 50 emails per folder. That was enough to find an apparent deal breaker with using a Windows application to process Mac files. It turns out that many of the attachments in this archive lack file extensions since MacOS and OS X didn't require extensions and used file creator/type meta data instead. The bottom line is that A4Mail considered the naked file names to have an "invalid format" and declined to convert them. So, I'm abandoning testing A4Mail. Has anyone tried the latest Emailchemy 12 on Mac OS X 10.8.4? How does it compare to the other alternatives? Thanks. Thanks for providing the new link here, Nello! We don't update articles after the fact because it's a very, very slippery slope, but it's perfect to have comments addressing such changes. "Attachments will be only re-attached for incoming messages - all outgoing messages will lack attachment information." I didn't see this limitation mentioned in this article. Hello Adam. I found this page while trying to figure out how to deal with about 17 years of Eudora. Still running 10.6.8 on my 5 year old iMac for that reason! Eudora is now crashing more often and so is my iMac. I will need to upgrade hardware and with it, look for email options. 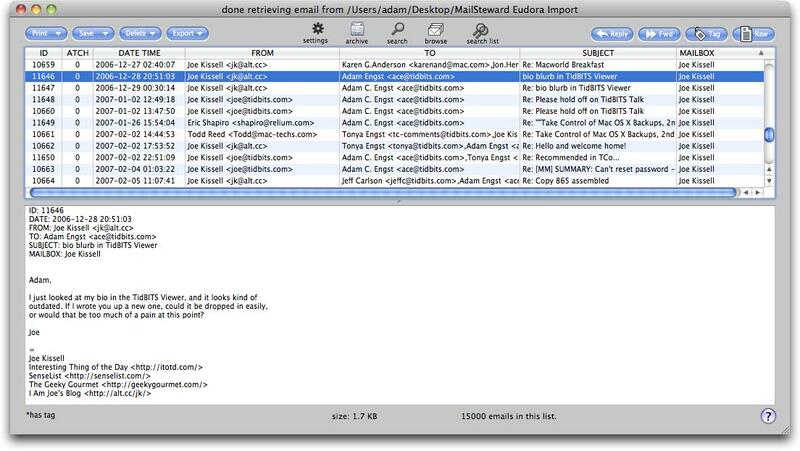 After reading your article I have decided to transfer all of Eudora to Apple Mail using Eudora Mailbox Cleaner. I already save all attachments I care about separately and am manually changing all slashes to dashes as I am not comfortable using Automator. I will then import into Apple Mail and rebuild mailboxes one at a time if needed. Redo all filters and address book. Once that is done, while mourning Eudora and all its wonderful functionality, I will be using Apple Mail both as an archive and as my email program. Makes sense as this won't be discontinued any time soon. Thank you so very much for all your hard work. It was all so daunting and confusing to me until you spelled out all the options. Glad it helped - it's a major move, I know! I have Mail Passport Pro ( http://www.mailpassportpro.com) working perfect for me. I'm not quite sure what you're talking about - Eudora is an email client, whereas Gmail is both a Web client and an associated service. So you could theoretically read Gmail (as a service) using Eudora (as a client). If so, you want to configure Gmail to use POP or IMAP, and then configure Eudora to pick up mail from it. All that said, I REALLY don't recommend you put any effort into using Eudora at this point in time. The program is simply dead, won't work on any recent versions of Mac OS X, and has no future. You should really be using something else, like Gmail's Web client, Apple Mail or Microsoft Outlook for the Mac. Your article is exactly what I needed. After several years of trying to figure out a way "out" of Eudora, I finally used Mailbox cleaner to transfer Eudora to Mail.app on OS 10.6.4. The only thing I'm not seeing in my address book as having transferred is my Eudora notes (which were extensive for many of my nicknames in Eudora). 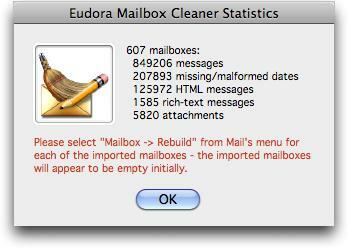 My question is -- doesn't Eudora Mailbox cleaner import over "notes"? And if it does, maybe there is a step I haven't yet completed. Any thoughts on how I can get my Eudora notes into Mail address book using another program? I also noticed that for my Eudora "out" box when it imported into MAIL that it only shows "Sent by" and Sent to email addresses. Is there a way to add that field back in? Honestly, it has been so many years since I used these apps, I really don't remember beyond what's documented in this article. I wouldn't be at all surprised if some metadata was lost in translation, though. Ok Adam -- no worries. I'll figure out a solution. Since Converting MBOX file to PST file is quite tedious and time consuming task, but can be done easily with the help of third party tool. There are multiple Software available near you, but the problem is how to use them, so I would like to suggest you one of the best tool to convert MBOX file to PST within minutes. Go with “SysTools MBOX to Outlook Converter” for safe and efficient conversion. What a lifesaver this article proved! Many, many thanks, Adam. With great reluctance I recently decided to let go of Snow Leopard, too many things just won't work, and so I needed to first bid farewell to Eudora (and TopCalculette Pro). I had close to thirty years of email to convert -- 1GB in the Mail Folder, some brought forward from an IBM mainframe. After running both for a few weeks, I found to my surprise that I preferred Apple Mail, irritating as it can be, to Thunderbird. - Apple Mail does a spotty job of directly importing Eudora mailboxes. Eudora Mailbox Cleaner is the better way to go, though you'll have to deal with the glitches Adam describes. While I enjoyed the challenges (most of the time), if I was starting over I'd probably pop $30 for Emailchemy. This happened often enough that, in retrospect, I should've looped my entire mail store through iconv beforehand. - If some messages aren't getting converted, and particularly when "? "s appear in the status field (Read, Sent, etc) of the original Eudora mailbox, select the entire mailbox and change everything to "Read." The dates displayed in Eudora might turn wacky, same timestamp for many messages, but this gets fixed when you then run the mailbox through Eudora Mailbox Cleaner. Such a blast from the past to hear from you, Tom, and about Eudora too... I'm impressed you still have your CORNELLC mail from back in the IBM mainframe days. Thanks for helping to keep this article a bit more up to date.